For other uses of Rōnin or Ronin, see Ronin (disambiguation). A rōnin (浪人, "drifter" or "wanderer") was a samurai without a lord or master during the feudal period (1185–1868) of Japan. A samurai became masterless upon the death of his master, or after the loss of his master's favor or privilege. In modern Japanese usage, sometimes the term is used to describe a salaryman who is unemployed or a secondary school graduate who has not yet been admitted to university. The word rōnin literally means "wave man". It is an idiomatic expression for "vagrant" or "wandering man", someone who is without a home. The term originated in the Nara and Heian periods, when it referred to a serf who had fled or deserted his master's land. It then came to be used for a samurai who had no master. (Hence, the term "wave man" illustrating one who is socially adrift). According to the Bushido Shoshinshu (the "Code of the Warrior"), a samurai was supposed to commit seppuku (also harakiri, "belly cutting", a form of ritual suicide) upon the loss of his master. One who chose not to honor the code was "on his own" and was meant to suffer great shame. The undesirability of rōnin status was mainly a discrimination imposed by other samurai and by daimyō, the feudal lords. Like other samurai, rōnin wore two swords. Rōnin used a variety of other weapons as well. Some rōnin—usually those who lacked money—would carry a bō (staff around 1.5 to 1.8 m or 5 to 6 ft) or jō (smaller staff or walking stick around 1 to 2 m or 3 to 5 ft) or a yumi (bow). Most weapons would reflect the ryū (martial arts school) from which they came if they were students. During the Edo period, with the shogunate's rigid class system and laws, the number of rōnin greatly increased. Confiscation of fiefs during the rule of the third Tokugawa shōgun Iemitsu resulted in an especially large increase of rōnin. During previous ages, samurai were able to move between masters and even between occupations. They could also marry between classes. However, during the Edo period, samurai were restricted, and were—above all—forbidden to become employed by another master without their previous master's permission. Because the former samurai could not legally take up a new trade, or because of pride were loath to do so, many rōnin looked for other ways to make a living with their swords. Those rōnin who desired steady, legal employment became mercenaries that guarded trade caravans, or bodyguards for wealthy merchants. 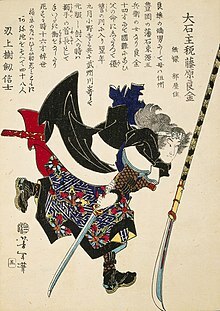 Many other rōnin became criminals, operating as bandits and highwaymen, or joining organized crime in towns and cities. Rōnin were known to operate or serve as hired muscle for gangs that ran gambling rings, brothels, protection rackets, and similar activities. Many were petty thieves and muggers. The criminal segment gave the rōnin of the Edo period a persistent reputation of disgrace, with an image of being thugs, bullies, cutthroats, and wandering vagrants. In the Kamakura and Muromachi periods, when warriors held lands that they occupied, a rōnin was a warrior who had lost his lands. During these periods, as small-scale wars frequently occurred throughout Japan, the daimyō needed to augment their armies, so rōnin had opportunities to serve new masters. Also, some rōnin joined in bands, engaging in robbery and uprisings. Especially in the Sengoku period, daimyō needed additional fighting men, and even if a master had perished, his rōnin were able to serve new lords. In contrast to the later Edo period, the bond between the lord and the samurai was loose, and some samurai who were dissatisfied with their treatment left their masters and sought new lords. Many warriors served a succession of masters, and some even became daimyō. As an example, Tōdō Takatora served ten lords. Additionally, the division of the population into classes had not yet taken place, so it was possible to change one's occupation from warrior to merchant or farmer, or the reverse. Saitō Dōsan was one merchant who rose through the warrior ranks to become a daimyō. As Toyotomi Hideyoshi unified progressively larger parts of the country, daimyō found it unnecessary to recruit new soldiers. Next, the Battle of Sekigahara (1600) resulted in the confiscation or reduction of the fiefs of large numbers of daimyō on the losing side; consequently, many samurai became rōnin. As many as a hundred thousand rōnin joined forces with Toyotomi Hideyori and fought at the Siege of Osaka. In the ensuing years of peace, there was less need to maintain expensive standing armies, and many surviving rōnin turned to farming or became townspeople. A few, such as Yamada Nagamasa, sought adventure overseas as mercenaries. Still, the majority lived in poverty as rōnin. Under the third Tokugawa shōgun Iemitsu, their number approached half a million. Initially, the shogunate viewed them as dangerous, and banished them from the cities or restricted the quarters where they could live. They also prohibited serving new masters. As rōnin found themselves with fewer and fewer options, they joined in the Keian Uprising (1651). This forced the shogunate to rethink its policy. It relaxed restrictions on daimyō inheritance, resulting in fewer confiscations of fiefs, and it permitted rōnin to join new masters. 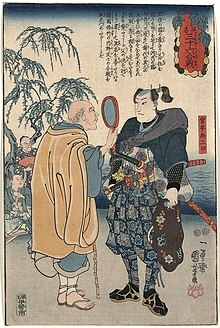 Not having the status or power of employed samurai, rōnin were often disreputable and festive, and the group was a target of humiliation or satire. It was undesirable to be a rōnin, as it meant being without a stipend or land. 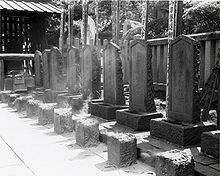 As an indication of the humiliation felt by samurai who became rōnin, Lord Redesdale recorded that a rōnin killed himself at the graves of the forty-seven rōnin. He left a note saying that he had tried to enter the service of the daimyō of Chōshū Domain, but was refused. Wanting to serve no other master, and hating being a rōnin, he killed himself. On the other hand, the famous 18th-century writer Kyokutei Bakin renounced his allegiance to Matsudaira Nobunari, in whose service Bakin's samurai father had spent his life. Bakin voluntarily became a rōnin, and eventually spent his time writing books (many of them about samurai) and engaging in festivities. Thousands of modern works of Japanese fiction set in the Edo period cast characters who are rōnin. Rōnin are often depicted in the jidaigeki of Akira Kurosawa, in particular Yojimbo, Sanjuro and Seven Samurai. The 1998 film Ronin portrays former Special Forces and intelligence operatives who find themselves unemployed at the end of the Cold War. Devoid of purpose, they become high-paid mercenaries. There is also a direct comparison of the characters to the forty-seven rōnin. The film 47 Ronin is a 2013 Japanese-American fantasy action film depicting a fictional account of the forty-seven rōnin. In the manga and anime Rurouni Kenshin, the hitokiri Himura Kenshin becomes a rōnin after the end of the Edo period, wandering for ten years in order to mend his sins and to complete the restoration. Samurai Jack, the main protagonist of his eponymous animated television series, is technically a rōnin because he serves no master and is mostly seen wandering the land, searching for a resolution to his quest to defeat his nemesis, the demon wizard Aku, after he casts a time travel spell that sends Jack into a future where Aku reigns supreme. Wikimedia Commons has media related to Rōnin. ^ "Rōnin, Japanese warrior". Encyclopædia Britannica. Retrieved 2009-08-29.